Herwig and Andrea Ronacher Architects signed the design of the four floors building made of six apartments and an office floor for Atelier Ronacher on the Ossiach Lake, Austria. The architects, graduates from the University of Vienna Technische Unversität, from 25 years they manage their studio together with 15 collaborators. Their buildings are between tradition and modernity, creating functional and beautiful places to live. Their professionalism has been repeatedly rewarded for hotel projects, service, and public buildings such as kindergartens, schools and hospitals. 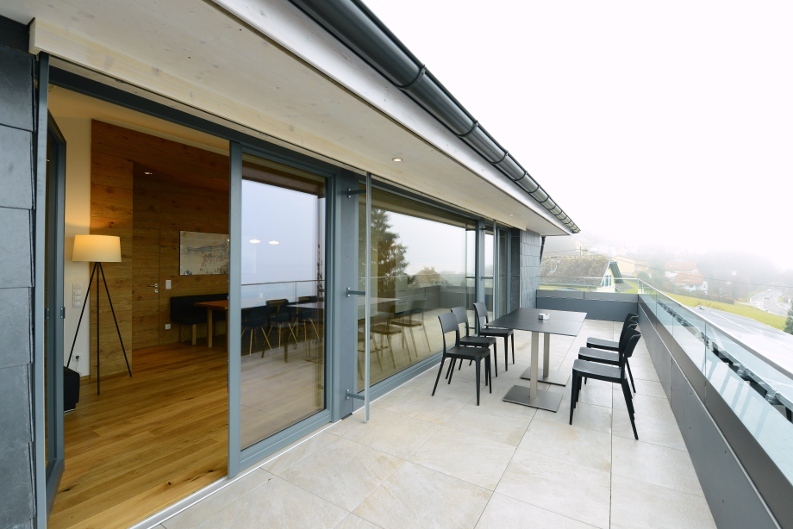 The project stands out for its interior design: for Herwig and Andrea has always been very important to build in innovative wooden buildings. “It ‘a theme that is close to our heart. Even the walls and ceilings, internal and external, were made with wooden exposed surfaces. For ceilings, for example we chose fir, for the bedrooms the stone pine and oak for the living area. The apartments have been integrated with full and warm tones produced with high-quality plaster made from clay, according to the criteria of natural architecture and green building." The architects continue: “The combination of upholstered chairs [Sonny, design Midj R&D] and anthracite with the white linen curtains complement the wide spaces used for the open space kitchen-dining-living room. To completition of the spaces, high quality furnitures customized in natural oak for the kitchen with stone floors and stoves flush in cristalceramic. In the end, to invite the soul to rock, covered balconies and a wonderful horizon on the lake. In Midj’s collection we have found an attractive and intriguing assortment of chairs and tables of modern desing for indoor and outdoor. In addition it adds the benefit of working with a company that has embraced the producer-consumer approach” From Midj’s collection we were chosen (over Sonny) also the chaise longue Relax leather-covered and Nenè chairs in polypropylene weatherproof furnishing the outdoor balcony."